In 11th century, a special type of sacramental painting or iconography developed in the largest church in Christendom, the Hagia Sophia, the Church of the Holy Wisdom, a title referring to Christ. The icons displayed Christ or Virgin Mary sitting on a throne flanked by emperors and the empresses, as if they were equals or even best buddies. An ancient wefie (group selfie) at best, or celebrity photobomb at worst. There is one rare exception that most visitors would not miss. Strategically located on the tympanum above the main entrance, the Imperial Gate, we see the depiction of Christ sitting on His throne. On His left is a strange figure not sitting but kneeling, or literally prostrating himself before Christ. Who could this figure be? Historians have identified him as Leo VI or widely known as Leo the Wise. Though popularly lauded as a relatively wise ruler, Leo was hardly a virtuous one. He had incurred the wrath of the Patriarch and the Church when he got married a fourth time which was prohibited by Church law, the first three wives died under strange and mysterious circumstances and coincidentally, none of them could produce a legitimate heir for him. His unique posture at the feet of the Lord, however, raises a myriad of theories. Some would see it as a penitential posture: Leo is placating the Lord and seeking pardon for his past crimes. 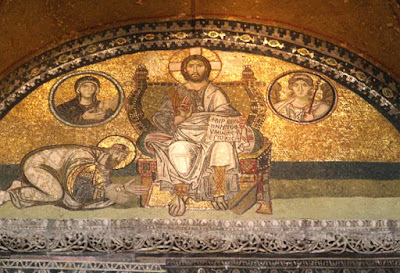 But when compared to the other mosaics within this grand church, this icon may be a reminder to all future emperors as they pass beneath it that no one is worthy (not even an emperor) to sit on the left or the right of the King of Kings. True authority and wisdom is not found in such seats of honour but only at the feet of Our Lord, Holy Wisdom, in humble submission and obedience. Today’s Feast also gives us a tale of wise men, who could also be kings, and who fell at the feet of Jesus to pay Him homage. Perhaps if St Luke had included additional information in his Christmas account, we might have had precise details. But St Matthew’s account is vague, shrouded in mystery: “After Jesus had been born in Bethlehem in Judaea during the reign of King Herod, some wise men came to Jerusalem from the east.” Intrigue swirls around these festooned foreigners. Where did they come from? With a wink St Matthew writes, “the East.” Indeed, his description is so utterly non-specific that church traditions in dozens of countries claim to be their country of origin. And who were they? Technically speaking, St Matthew, using the Greek term, calls them magi—but what are magi? Are they kings? Wise men? Christians have been trying to nail down their identity for millennia. St Matthew’s story demonstrates that the Magi were astrologers and interpreters of omens—following a star and dreaming dreams. As early as the second century A.D., Tertullian was laying out arguments that the Magi, while astrologers by trade, were considered kings. He argued that their visit fulfilled Solomon’s prayer in Psalm 72—“May the kings of Sheba and Seba present him gifts.” Despite disagreements about their true identity and origin, here are a few facts. The word magus is of Persian origin; however, Basil indicated that they were not confined to a specific empire but “scattered all over the country,” which subsequently gave rise to the medieval tradition that they represented three different continents, Asia, Africa and Europe (the Americas were yet to be discovered). As a result of the three gifts offered to the infant King, gold, frankincense and myrrh, their unspecified numbers were eventually narrowed down to the three. Call them Magi. Call them wise men. You can even call them kings if you’d like! Each label shines a light on a different facet of the story. Whatever you choose to call them, these men are the first in the canonical New Testament to bow and worship the Lord Jesus. We would do well to follow their example. Pope Emeritus Benedict describes the Magi as men of hope and seekers after truth who, in every generation, have been on the look-out for the true star of salvation. There is a restlessness at the heart of our humanity that is always searching for fulfilment. It is a restlessness that drives our lives and can bring our lives to the only One who can bring rest to our restless souls. In following the star, the Wise Men pursued that universal longing of the heart, refusing to be led astray until they came to Jerusalem. When they finally found the child, their excitement could not be contained. “The sight of the star filled them with delight, and going into the house they saw the child with his mother Mary, and falling to their knees they did him homage.” The search for wisdom, the search for Truth finally led them to kneel before the Christ-child. This is the key to understand their story. These wise men or kings had come to worship the King of Kings. They understood who He was and what their place was. They did not come to hang out with Jesus. They did not arrogantly arrogate to themselves the right to sit on his left or right as equals. Their proper posture was to kneel in humble submission at the feet of the Lord. These wise men knew that they were not His buddies, bros’ or BFF’s. They came to worship Him. This is a point that is so often ignored in the confusion generated by the dumbing down of theology and liturgy, the latest church fads and even within what passes for music these days. There is a purposeful blurring of the lines between whom we are and who God is. Contemptuous familiarity, in the form of casual dressing and postures, seems to be the norm of the day when coming to church. There is little or no serious sacrifice on our part. It implies a kind of friendship without any serious commitment. That explains the demand and the push for lighter, shorter, less painful and uncomfortable, more fun, more exciting, more creative, and definitely more entertaining masses. The story of the Magi has been celebrated in song and Christmas pageants and their images have adorned our beautiful crèches. But, their story holds so much power for us in our lives if we could only learn from them. It is a reminder that our search for what is good, what is beautiful, what is true can only find its ultimate fulfilment in the person of our Lord Jesus Christ, the King of Kings and that true wisdom can only be found when we are prepared to kneel at His feet. Let us not come with empty and grasping hands but with everything that is of value to worship the true King and Saviour of the world. Venite Adoremus! Come let us adore Him!